Today is the anniversary of my wedding to my colonial gentleman; it seemed right, then, to post something with a marital flavour and I settled on a rather fetching ring that was given by a King to his bride. I have a soft spot for such things as my own engagement ring met with a terrible fate that almost cost me a finger too, of which more anon. Now on with the tale, which happily contains no gruesome accidents or jewellery disasters! On 8th September 1761, George III married Charlotte of Mecklenburg-Strelitz in the Chapel Royal at St. James's Palace. The ceremony was presided over by the Archbishop of Canterbury, Thomas Secker and the marriage was a long and eventful one, ended only by Charlotte's death in 1818. Following Queen Charlotte's death, her jewels were divided amongst her daughters and many were sold on. 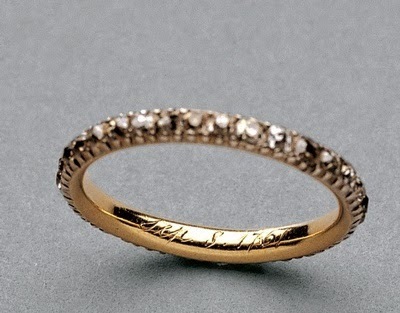 The diamond ring, however, remained in the care of Charlotte, Princess Royal, and was later inherited by Queen Victoria. It remains in the Royal Collection, though I cannot help but wish it had stayed with Queen Charlotte at her death, but perhaps that's the romantic in me coming out. I am pleased to relate that there was a happy ending to my own sorry story as the stones from my pulverised engagement ring went onto a new life as a beautiful necklace. Indeed, my gentleman was kind enough to present me with a new engagement ring too, which is now sitting happily alongside my wedding band on my happily recovered digit! Aw, I think more of your colonial gentleman for the extra sweetness. Aw, thank you; I told him and he looked very bashful.